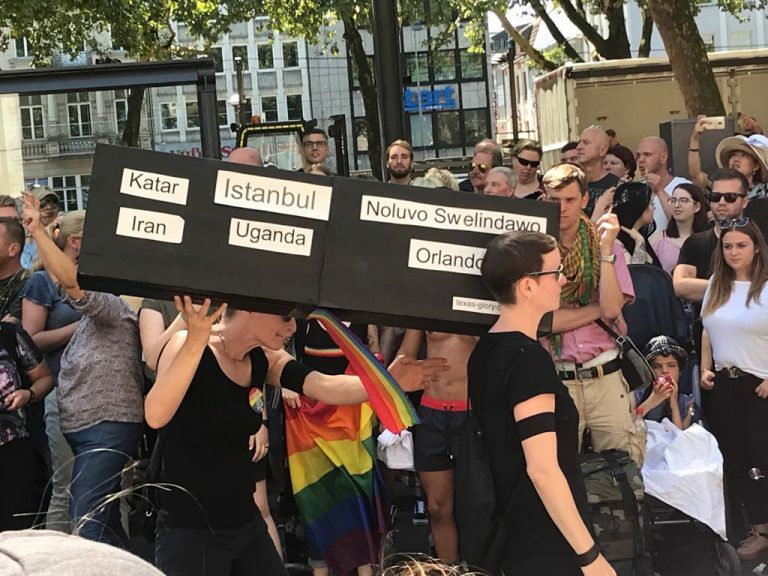 in memory of the people who couldn’t walk with us in the parade in cologne and for those who can’t live free, we carried a coffin. when do you ever have the opportunity to reach one million spectators? dear organizers of the cologne pride, we are so sorry for not signing up upfront. we just sneaked in and led the demo. why? quite simple – because we had something to say. for years the pride has been totally commercially exploited. but there is so much more than commerce. the organizers did not send us away. 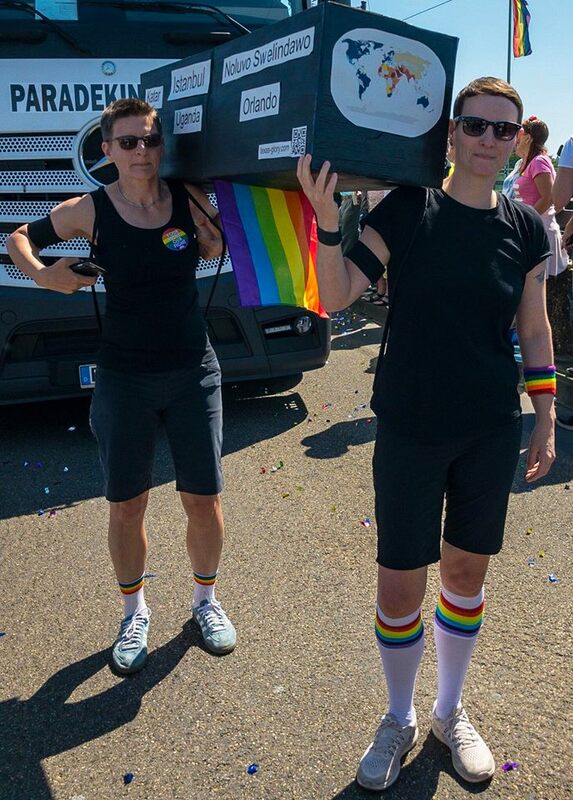 on the contrary, we were allowed to lead the parade directly behind the dykes on bikes. thousands of pride participants followed the coffin. inspired by contemporary LGBTTIQ* advocacy groups like act up we are committed to non-violent, direct action activism. by way of peaceful methods, we stand together to achieve a common goal: freedom and dignity for all LGBTTIQ* people. according to the international lesbian, gay, bisexual, trans and intersex association (ilga), there are still 72 countries and territories worldwide with anti-homosexual laws. death penalty threatens homosexuals in 13 countries. these include countries such as iran, saudi arabia, the united arab emirates, qatar, and parts of nigeria. pride is celebrated in many cities all over the world. for many people, the pride parade is to party. the political character has mostly been lost over the years. the external perception of the pride is no longer a political demonstration for most people in most countries. we have nothing against partying and fun. but we should always keep in mind how well we are doing living in a democracy. not all people are doing as well as we are. in cities like cologne, we are living in a bubble. there are other cities where no pride can take place at all. there are still countries where people have to suffer persecution and discrimination. people are being murdered just for not corresponding to the heteronormative expectation of their societies. to show our solidarity, we marched for all the people who can’t do it themselves.